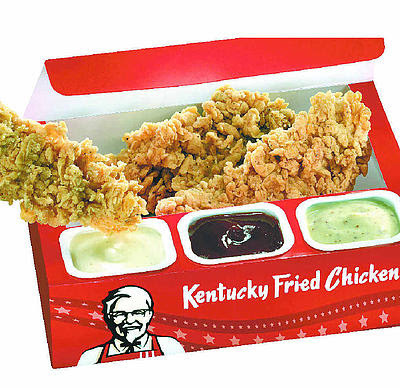 Weighty Matters: KFC - Where 43% of Your Chicken's not Chicken! My friend Julie Van Rosendaal who writes the blogs It Must Have Been Something I Ate and Dinner with Julie sent me something truly wild. It's a PDF from KFC that details the ingredients of their menu items. The ingredients themselves are a veritable witch's brew of preservatives and items meant to improve things like the mouthfeel of food with such things as sodium stearoyl lactylate, calcium peroxide, xanthan gum, sodium benzoate, carrageenan and many more. The best part though is the "chicken". Why is the word chicken in quotations? How 'bout if I told you that 43% of the ingredient known as chicken in KFC's chicken strip wasn't chicken? "Chicken Breast Strips Containing up to 43% of a Solution of: Water, Seasoning (Soy Protein Concentrate, Salt, Rice Starch, Carrageenan, Dextrose, Onion Powder, Dehydrated Chicken Broth, Maltodextrin, Spice Extractives), Sodium Phosphate. Breaded with: Wheat Flour, Salt, Spices, Monosodium Glutamate, Leavening (Sodium Bicarbonate), Partially Hydrogenated Soybean Oil, Garlic Powder, Citric Acid, Enriched Wheat Flour (Niacin, Reduced Iron, Thiamine Mononitrate, Riboflavin, Folic Acid), Natural Flavor, Maltodextrin, Sugar, Corn Syrup Solids, Wit Not More Than 2% Calcium Silicate Added as an Anti Caking Agent." Thanks Julie, and thanks KFC - you're always a pleasure to blog about!